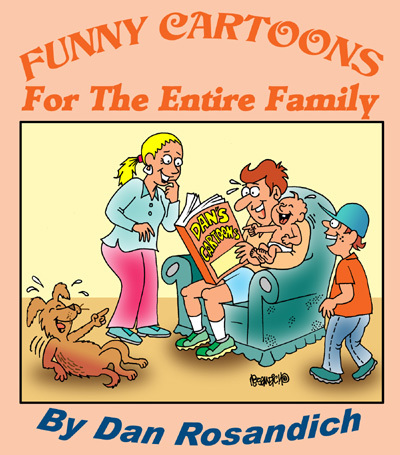 Great Lakes Features syndicates all of the cartoons created by Dan Rosandich. 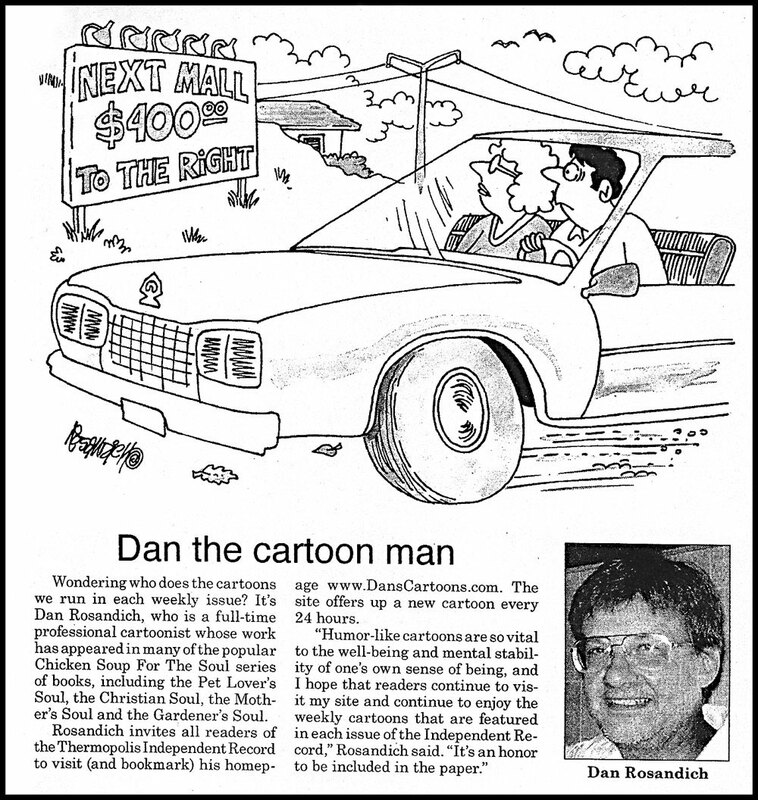 The single panel cartoons that Dan has created have appeared in newspapers throughout the United States. Visit my extensive database and choose any cartoons and make a package of your own, either by choosing 60 cartoons, 180 different cartoons or even a year’s worth of panels. I offer thousands of cartoons you can choose from. 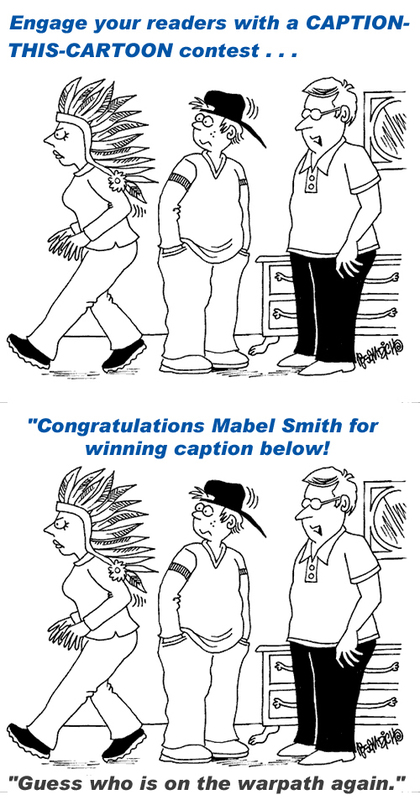 A weekly newspaper can receive a one year package of cartoons that can be selected by the editor or publisher and have that folder of images immediately shipped to the email address you specify. If you’re a daily publication, the same process applies. Choose 60 cartoons for your yearly package and for daily newspapers, choose 370 different images. DansCartoons puts you in control where you can build your own package of images by browsing the various categories of images and building your collection as you go along through all of the catalogs. There is a greater amount of flexibilty that you can keep in mind since you have options, such as assembling a six month package of 30 cartoons or for a daily paper, try the 185 cartoon package. Keep in mind other options such as an “Outdoors Page” your newspaper might have, the ‘Hunting Cartoons’ catalog will be your source for cartoons that would apply to that column. Perhaps your newspaper has a section or column devoted to “Health Topics”, then the ideal selection of cartoons to choose from would be the ‘Health Cartoons’ catalog. Does your paper have a “Medical Tips & Info” column or section? Then those cartoons found in the “Medical Cartoons” would apply. Do you prefer the artwork be sized to a specific width? 4.75 inches wide or to fit a certain width column? If you have a chain of newspapers and want to apply a series of cartoons in a single package to that group of newspapers, please let me know in advance as use of cartoons across multiple papers is taken into consideration when providing a fee quote. If your newspaper seeks custom editorial illustrations, I specialize in artwork tailored to your information and instructions and special rates would apply. Please email me for more information and supply your concept in advance. Email dan@danscartoons.com and a prompt response with all of the information is guaranteed. Another cartoon feature to consider for your newspaper is the daily web cartoon that I offer which can be used on your newspaper’s web site. A short, simple line of code can be supplied that your web designer can add to your HTML where you want the cartoon to appear . An example of how the cartoon is used by a newspaper web site is The Sky Valley Chronicle in Everett, Washington and visit daily cartoons for newspapers to get an idea as to how the image can add to your web presence and keep your visitors returning for new humor every day.